Today, In this tutorial I am going to show you how we can play music files in python scripts. Many times in many python projects or scripts we have/need to play with music and sound files. By the way, Listening Music is my favorite way to make my mind stress free and I hope you also like music listening habits. basically, In today's busy life, music is really very beautiful part of our life and of course to run any music.. music playing app is one of the basic requirement. Actually, In Python, there is no built-in library that can help us in playing an mp3 sound file and produce noise from speakers. Therefore, To play any music file, programmer always needs to take help from any External Or third-party modules. Basically, there are many types of modules that can easily play music files but here, In this tutorial, I am going to use pyglet. well well, there are many reasons to choose pyglet library (Discussed In Below Section ) But The main reason to choose pyglet library is its Cross-Platform Support features. Yes, Yes, With This Library You can easily play music on any Platform without doing changes in Your written codes. hence, before sharing my codes here I am going to write about Pyglet Module. Ans. As Wikipedia says “Pyglet is a library for the Python programming language that provides an object-oriented application programming interface for the creation of games and other multimedia applications. 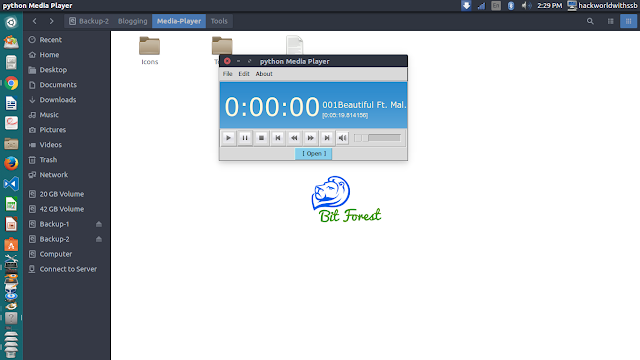 Pyglet runs on Microsoft Windows, Mac OS X, and Linux; it is released under BSD Licence."" Q 3. Why I Select Pyglet Module To Play Music? Basically, I am just going to use pyglet module API to play music file Nothing Else. Because Pyglet library can handle other operation on its own so you don't need to worry about it. To make our tutorial more interesting and useful, we going to create a class object loaded with all functionality of pyglet module to handle any music file in the simplest way. So, in future, you just need to import class object and use it play music. the last line is to keep running thread alive. Simply To play Music with Above Class, You Just need to Type Below Codes at the bottom of the same script. Well, Friends From Here I am going to left further exercise to the reader. so that he/she can understand exactly what happens in these codes. I am working on the project where I have to open the player and play music automatically, so there I am avoiding human interaction. Will this be useful for me? files... With the help of its modules..
hallo. i tried to work with pyglet but, when i write "import pyglet", python says "No module named 'pyglet'. That error Means You First need to Install pyglet module. For More information, Search Google. "/media/giordano/KINGSTON16G/python3/anagrafiche/song.mp3" was not found on the path. Ensure that the filename has the correct captialisation. anyway, file "song.mp3" exists in that path.